Banana is tropical fruit that is good for our health. In Indonesia and Malaysia, it is called pisang. Although it is grown in tropical region, it has been famous and consumed around the world. Riped banana fruit has got sweet taste. In some Asian and Pacific countries, banana is sometimes steamed or boiled and served on a plate during dinner or lunch time as alternative variation to rice and sweet potatoes. Banana is often deep fried in hot coconut oil and offered in small kiosks and big supermarkets as snacks. They are usually eaten with sweet tea and coffee. The types of banana in Indonesia that are fried with wheat flower are Pisang Kepok (also known as Saba banana) and Pisang Raja (literally means King Banana). Pisang Raja is very sweet when it is fully riped. In Wikipedia, Pisang Raja is called Latundan banana. That's its name according to the Philipines' version. However, I personally do not know whether it is exactly the same as Pisang Raja that we consume in Indonesia. The fried banana that I saw in supermarket is sometimes added with such topping as grated cheese and palm sugar. 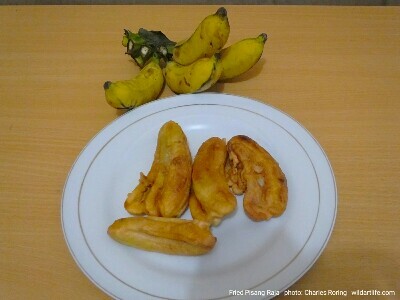 There is also kolak pisang which is a popular traditional food among Indonesian families. To make, we need 8 fruits of half ripe kepok banana or 10 fruits of half-ripe raja banana. a glass of coconut milk, and two pieces of pandan leaves, 120 grams of palm sugar and 3 glasses of water. First, banana fruits have to be peeled and cut into smaller bite size pieces. After that the bananas and the pandan leaves have are put inside a boiling pan. Water is poured into the pan. We boil them until the water is boiling. After that we add palm sugar and stir them again until the whole sugar changes into liquid. And then we pour the coconut milk stir the kolak pisang. We can taste it. If it is not sweet enough, we can add some ordinary sugar. But the kolak is already delicious with the palm sugar and coconut milk. When it is fully boiling, we can turn off our stove. Now the kolak pisang is ready to be served on the table. The domestic and international demand for fresh banana fruit is very high. 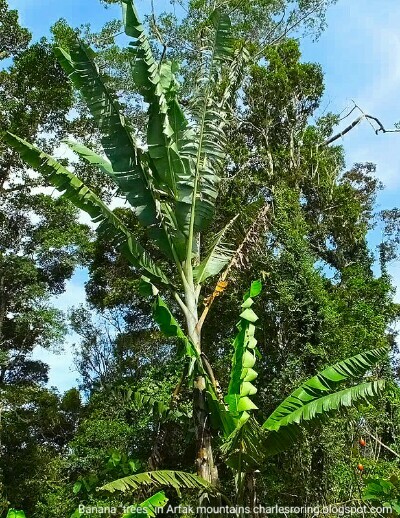 Plantations that grow cavendish banana are opened every where in various tropical countries from Malaysia, Indonesia, the Philipines and Brazil.